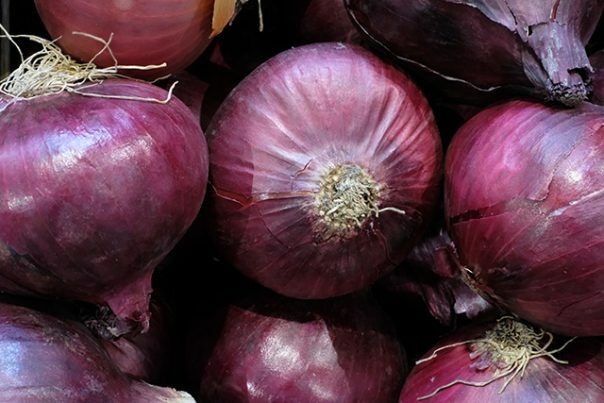 Red onions, which belong to the lily family, have purplish red skin and white flesh that have tinges of red on them. They are also called purple onions and Spanish onions. Their scarlet appearance tends to lighten after they are cooked. They range from medium to light size, have a mild and sometimes sweet taste, and are eaten cooked with other food, raw, or grilled. Red onions are a good source of quercetin, which is a bioflavonoid that is essential in fighting free radicals in the body. They are also a good food choice for preventing gastric ulcers. Allicin, a compound that is good for heart health, cancer prevention (breast, colon, lung, ovarian, and prostate cancers), and blood pressure regulation, can be found in red onions. Because allicin also contains anti-fungal properties, it can be good for treating dandruff. Insulin resistance sufferers would be glad to know that red onions are rich in chromium, which is an important mineral to facilitate insulin activity in carbohydrates, fats, and protein. Red onions can help lower cholesterol levels to prevent cases of obesity, stroke, and coronary heart disease. They also alleviate symptoms of type-1 and type-2 diabetes and polycystic ovarian syndrome. Red onions, with a glycemic index rating of 10, are an ideal food for people who are on a diet. Low glycemic food have the tendency to make people feel full and energized, so that they don’t need to eat big portions during their next meal. Red onions have anti-inflammatory properties that can be good for people who are afflicted with allergies, arthritis, or asthma. You can get instant pain relief when you apply red onion extracts to the part of your body where you have been stung by a bee, without the side effects. Red onion consumption can do wonders for your digestive issues for a serving of red onions contains 1.5 grams of fiber. which aids in the proper functioning of the digestive tract and prevents constipation. Red onions’ antioxidant properties can also inhibit liver peroxidation, which results in cell damage. Red onions are good for the immune system. They have phytochemicals that help vitamin C conduct its function of shielding the body against disease, infection, and common ailments such as fever, flu, and the common cold. Even though red onions have a pungent smell, they are extremely flavorful; that is why they are the perfect add-ons to salads, sandwiches, soups, and other dishes.Some of the best red onion recipes can be found here. Red onions are a good source of quercetin, which is a bioflavonoid that is essential in fighting free radicals in the body. Red onions are an ideal food for people who are on a diet. Red onions have anti-inflammatory properties that can be good for people who are afflicted with allergies. Red onions are good for the immune system.